Straight after the attack, hundreds of people began to protest against President Bashar al-Assad, according to activists, as some blamed the regime for the attack. Fifteen civilians were killed in a bomb attack today in a government-held district of the central Syrian city of Homs, state media reported. “A terrorist attack struck the Hamra district of Homs,” the state SANA news agency said, adding that it killed 15 people and wounded 24. State television said it was a car bombing. 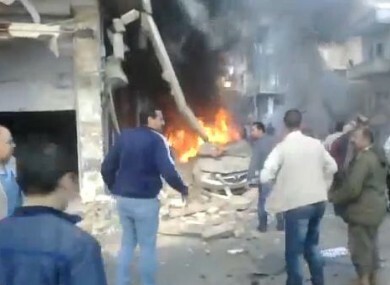 The Britain-based Syrian Observatory for Human Rights also reported a car bombing in Homs. “At least seven civilians were killed in a car bomb explosion near the sports stadium,” it said, adding that many of the wounded were in a critical condition so the death toll was likely to rise. Amateur video footage posted online by opposition activists showed the bodies of at least three victims, including a woman buried in the rubble of a building as a car burned not far away. Another video showed a car turned upside down on a pavement, as other vehicles blazed nearby. A third video showed an injured child lying in hospital, wailing in pain. Straight after the attack, hundreds of people started to protest against President Bashar al-Assad, according to activists, as some blamed the regime for the bomb attack. “May God humiliate you, O Bashar!” shouted crowds of protesters, as shown in amateur videos uploaded to the Internet by activists. Regime and rebel forces have frequently exchanged blame for bomb attacks, in a conflict that has grown increasingly bloody since it broke out in March 2011. Homs is Syria’s third largest city and was one of the cradles of the armed uprising against Assad’s rule, earning it the monicker of “capital of the revolution” from opposition activists. The city suffered devastating violence early this year, and for the past six months the army has kept the mainly Sunni Muslim rebel-held districts around the centre under suffocating siege. Email “Fifteen killed in Syria car bombing ”. Feedback on “Fifteen killed in Syria car bombing ”.